Director of Production for (le) poisson rouge, one of NY’s most innovative performance venues, Jonathan has been with LPR from before its first event in 2008, and has overseen technical advances and systems to help set the standard for NY venue production and service options. Jonathan studied Directing at Fordham University and went on to focus on live production. 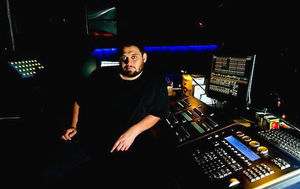 He has done Lighting Design and Production Management for shows around the world. (le) poisson rouge has established a broadcast/streaming partnership with NPR (NPR@LPR), which hosts multiple weekly streamed/broadcast performance events for Tidal, Pitchfork and many other leading new media firms. Notable Livestreams have included: Iggy & The Stooges, Spoon, Alt J and Flying Lotus.